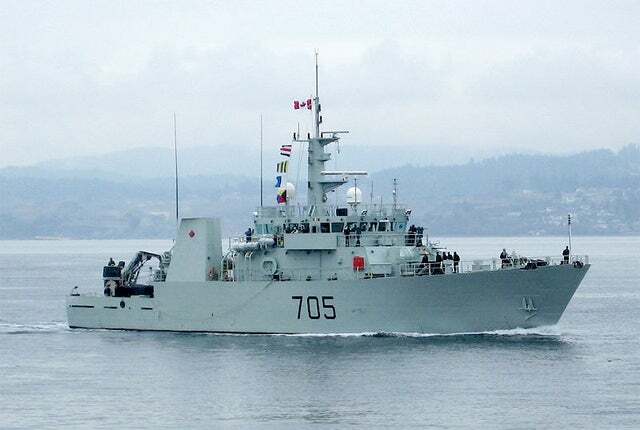 HMCS Whitehorse (MM 705) Kingston Class coastal defence vessel. HMCS Kingston first of class was launched in 1995. HMCS Glace Bay. Six ships are stationed on the east coast for operations on the Saint Lawrence and Atlantic, and six ships are based on the Pacific coast. HMCS Glace Bay second of Class on trials. The launching of the Shawinigan. The Shawinigan about to embark on trials. The Kingston Class maritime coastal defence vessels were built by Halifax Shipyards Ltd owned by Saint John Shipbuilding of Canada. The first of the 12 ships was commissioned in September 1996 and the final one was commissioned in April 1999. The ships are named the Kingston, Glace Bay, Nanaimo, Edmonton, Shawinigan, Whitehorse, Yellowknife, Goose Bay, Moncton, Saskatoon, Brandon and the Summerside. Six ships are stationed on the east coast for operations on the Saint Lawrence and the Atlantic and six ships are based on the Pacific Coast. The 12 Kingston Class ships provide a single class of vessels for multifunctional use by the Canadian Naval Reserves. Canada is the second largest country in the world and has a coastline of 243,791km. The main roles of the ships are: coastal surveillance, naval reserve force training, mine countermeasures for route survey, minesweeping and mine inspection operations. The hull is a longitudinally framed structure and has been designed to minimise the steel weight. The design was based on a hard chine hull form. The construction involved initial production of partially outfitted steel block units, which were assembled into blocks and the blocks were integrated into the ship. The decks were assembled upside down with pre-outfitting of the underside of the deck prior to installation on the ship. "The 12 Kingston Class castal defence ships provide a single class of vessels for multifunctional use by the Canadian Naval Reserves." The vessels are capable of carrying two 20ft ISO containers on the open deck aft. The decks are fitted with the necessary power cables ready to install the containers which are mission-specific operational payloads. The degaussing system from Power Magnetics and Electronic Systems of Rugely, Staffordshire (previously Thorn Automation) provides three dimensional control of the magnetic signatures. The size arrangement and location of the degaussing coils are based on finite element modelling of the ship structure and major equipment fits. The degaussing system consists of a masthead magnetometer which controls the output of the system’s power units and the signature, four horizontal "M" coils, eight vertical "L" coils and five vertical athwartships "A" coils. The ship is equipped with one of three modular mine countermeasures systems: the deep sea Thales MMS mechanical mine sweeping system, the route survey system or the Sutec remotely operated vehicle (ROV) mine inspection system. "The Kingston Class ships are equipped with one of three modular mine countermeasures systems." The navigation equipment is a Kelvin Hughes I-band navigation radar and a global positioning system. The surface search radar is the E to F-band Kelvin Hughes 6000. A towed high-frequency sidescan sonar is fitted for minesweeping. The ship is equipped with four main Wärtsilä UD 23V12 diesel motors and four alternators and two Jeumont electric motors (600V DC). The two LIPS Z drive azimuth thrusters are fitted with fixed-pitch reversing propellers. The propulsion system is equipped with a central control and monitoring system. The propulsion system provides 15kt maximum continuous speed. The range at the economical cruising speed of 9kt using two engines is 5,000nm with a 20% margin in tank capacity. Mechanical minesweeping is carried out at 8kt. The crash stop length is five ship lengths from a speed of 15kt.